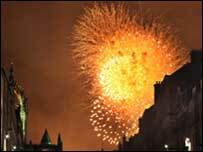 A spectacular fireworks display lit up the skyline as the Edinburgh's International Festival drew to a close. The 2008 Edinburgh International Festival posted its highest ever box office takings, report organisers. The director of Edinburgh Festival Fringe announces he is to step down after just over a year in the post. The Edinburgh Mela grows to a week-long gathering of culturally diverse events. Top stand-up Richard Herring has hit out at the decision to give the "Spirit of the Fringe" to every comedian. Sir Sean Connery celebrates his 78th birthday by launching his memoirs at a sell-out event in Edinburgh. Too young to appear at Fringe?